Robust construction, comfort, and performance that rivals V-bottom boats—especially if the helmsman adjusts for optimum trim. Traditional pontoon-boat thought has been to slap one big box on the boat’s stern. That gives you a sunpad up top, ample stowage below, and (in the days of noisy two-strokes) also helped suppress engine noise. Harris FloteBote’s Grand Mariner SL 250 dares to be different. The Grand Mariner SL 250 takes a different approach when it comes to layout at the stern, with comfortable seating and an ample swim platform. Take the rearview of this 26 footer and you’ll find a wide-open design, with a spacious swim platform and aft seat that features a pivoting backrest. Pivot it aft and it completes the already spacious cockpit seating; pivot it forward and it moves the focus toward lounging and swimming behind the boat, for those times when you need your own personal island. Kicking back on this recliner, I found the stereo remote and drinkholders within easy reach. 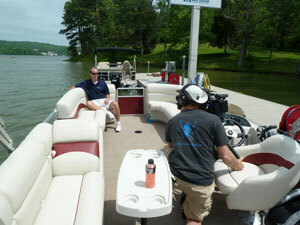 The middle pontoon is part of an optional performance package that improves handling. 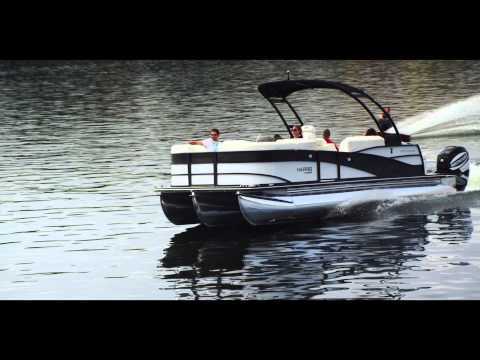 It’s fresh, it’s innovative, and it’s a great example of how manufacturers are blurring the lines between pontoons and their fiberglass, V-hull counterparts. 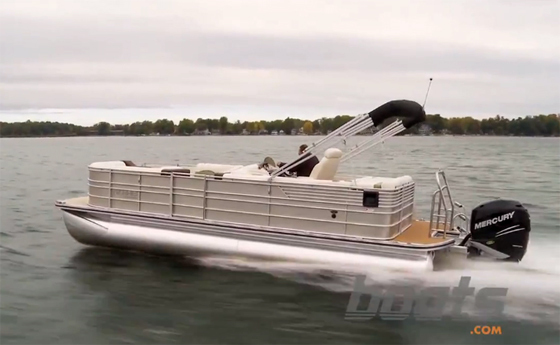 Pontoons aren’t just mimicking V-hulls in terms of amenities. They’re also stealing some of their performance thunder. When I cranked the wheel at speed, my test boat didn’t perform the flat, momentum-shifting turn pontoons are known for. Instead, it banked sweetly into an arc. 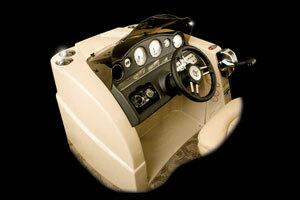 Much of the reason for this can be found in the boat’s optional XTR Performance Package ($7,370). It adds a third pontoon to the mix (better for handling those heavier, powerful four-stroke outboards and large crews), lowers it an additional 2” below the outer logs to enhance that V-hull effect, and flattens off its keel before transitioning into a similarly angular motor pod. 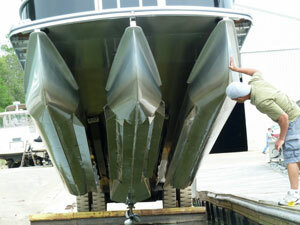 Large, full-length lifting strakes are added to the inside of both outer pontoons, as well as both sides of the central pontoon, and the bottom is finished off with a clean aluminum skin. That eliminates the resistance of water hitting the cross members. The Grand Mariner’s construction methods are similarly advanced. My test boat featured cross members that were spaced 16” on center; standard spacing is 24”. That adds strength to the frame. Further strength is provided by the boat’s ultra-beefy M-brackets (risers) that attach those pontoons to the cross members. Rather than being segmented, or solid only on the outer side, both sides of the bracket are solid for the length of the pontoon. Fasteners? They’re high-tech screws, put in with enough force to almost form a friction weld. 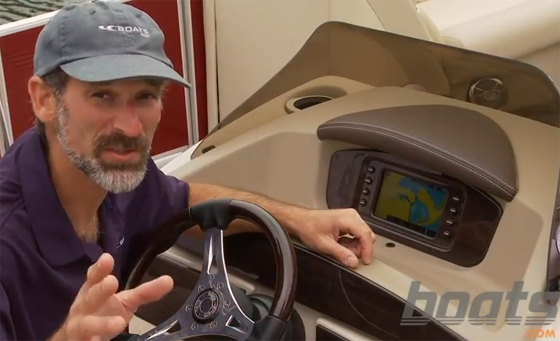 The SL 250 console is well-designed, with gauges easy to see from the captain’s seat. 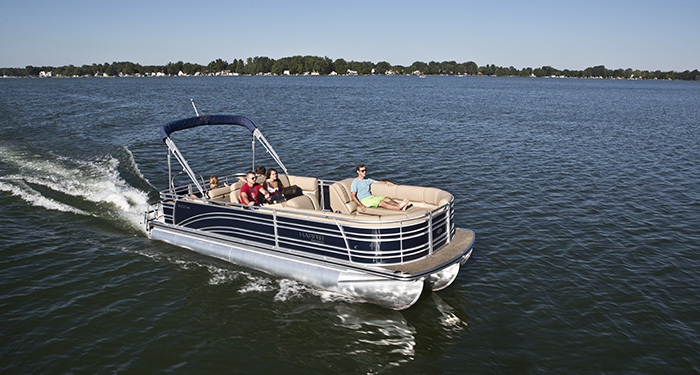 During performance testing, the Grand Mariner accelerated hard enough out of the hole to pull a water skier or wakeboarder en route to a top speed of 38 mph. Its banking turn almost made me forget I was at the wheel of a pontoon, but it came with a trade-off: I found myself frequently adjusting the trim, dropping the bow for hard cornering, while raising it to achieve the running angle required to reach top speeds. Beyond performance and construction, there are a number of other features that stand apart. By making use of the space in the center pontoon (which also houses the fuel tank), designers gave the boat an expansive in-floor ski locker. It easily swallows up the water toys, and comes equipped with a bilge pump. The users of those toys will also appreciate the beefy towbar aft. Rotomolded seat bases provide stowage throughout. At the helm, I found a captain’s chair truly befitting the name, along with a clear view of the gauges on an attractive fiberglass console. And yes, there are the requisite cupholders -- over 20 spread throughout the boat. Add the optional LED lighting and they’ll even glow at night. The price of all this luxury? It’s not cheap. Expect to pay about $60,000 to pick up this boat as tested, including the 225-hp Mercury Verado and XTR package. 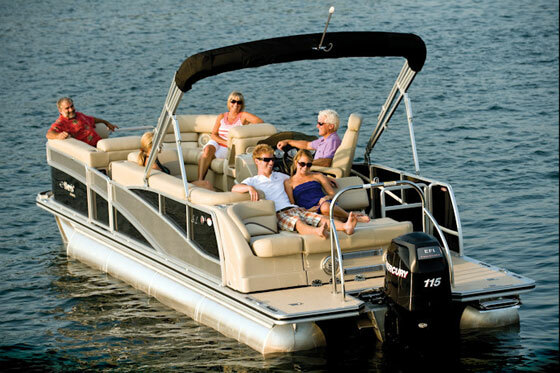 But if you’re in the market for a top-of-the-line pontoon that just may rival your neighbor’s V-hull — you owe it to yourself to give the Grand Mariner a turn. Literally.